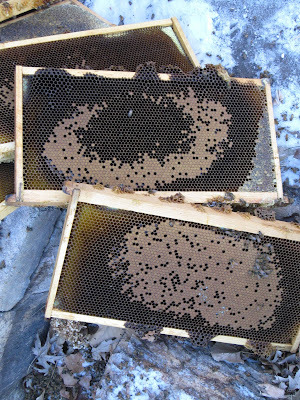 Notice there is no or very little honey on these brood frames. The bees ate it all keeping the brood warm. A beekeeper sent me these pictures. He had planned to kill off this colony. A two deep hive. The colony still had a top box full of honey. 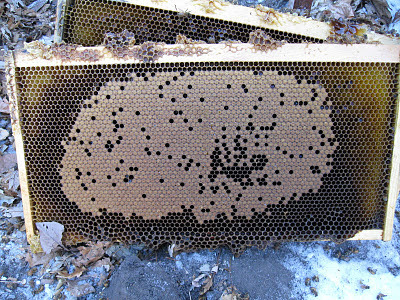 When he went through it he found more than two frames of brood in the hive. This is not a good deal to have this much brood in a colony in mid - January. If it was February it would be ok. Now the food consumption will increase dramatically. The odds of the colony eating themselves out of food are very high. In Nebraska they were experiencing temperatures into the 50's and 60's. The beekeepers there are worried about a huge loss due to starvation. The warm weather that was around for an extended period has many colonies around the state in this predicament. Not much we can do right now. Hopefully the bees can make it into Feb and then reassess the food stores. I will be sending out order forms in the mail starting this weekend. Two classes in the metro area. They are both very good and will help all beekeepers be successful. Sign up right away they fill up fast. 12807 (8 classes) Thu 6:30 pm–8:30 pm Sitko, Robert Note: The field trip date will be announced in class. Look under enrichment in the Century catalog. Found my scale hive a complete dead out on Sunday. I took apart the colony for an autopsy. My CSI inspection yielding the following. The colony produced a very good honey crop last year. Going into fall, the population was strong and the winter stores were adequate. Opening the top box I noticed that there still was ample honey in the top box with a few scattered dead bees around on the frames. Taking this box off I looked at the next box. Dead bees were randomly scattered around the box with no apparent cluster of bees. The total amount of bees in the hive was less than a 2 lb package. No brood were to be seen in any frames. This leads me to conclude how the bees died. Due to my busy schedule last fall I was unable to treat this colony for mites. I paid the price for this with a dead colony. The bees with a high mite infestation will dwindle in the early winter. The bees just fly away and the result is very few bees dead in the colony. So it is close up the colony and replace it in the spring with a new package. With all the honey left I will not be feeding much in the spring. The warm weather we have been having gets me thinking that the bees maybe thinking it is early spring. The queen may have started to lay in some colonies. If this has happened the food intake will increase as the bees will need to feed and keep the brood warm. Hopefully most colonies don't have access to pollen yet. This will keep the bees from raising brood. Normally when the bees put up honey, they will stack it on top of pollen that is already in the cell. As they consume honey over winter the pollen becomes exposed and available for use. Warmer weather may increase the desire to get started for spring build up. Colder weather will be moving in later this week for a more normal weather. The cooler weather should cool the desire of the hive to raise brood. At this time beekeepers can't do anything but enjoy the nice weather. This winter has been easy on the bees so far and if it stays on the mild side the bees should winter in great shape. I take it most beekeepers have heard of the much hyped zombie bees that has come out in the last week. The honey bees that have been parisitized by Phorid flies. The media has hit this with gusto just like a bee truck rollover. It looks like the media has really run with the whole zombie-bee phorid thing. Charles and I are authors on that paper, but I want you to know that we do not agree with the statements being made in the press and by others,claiming that phorids are even remotely responsible for colony collapse. You may hear from your stakeholders that are listening to the popular press today. The media is way over-hyping this story. I have been getting requests for package bee information. At this time I do not have any pricing for the new season yet. I don't think I will see it until after the ABF convention in Las Vegas that runs from Jan 10th to the 15th. As soon I have the information I will get out the order form. Happy New Year to all of my fellow beekeepers. The new year is upon us and for now all seems well on the overwintering side. The warm Dec has given the bees a month of tropical winter weather. Hopefully the bees didn't start raising any brood during this nice stretch of weather. Honey consumption during this time should have been low do to the string of warm days. Not much stress on the bees so far. I checked my hive scale today and it went down 10 lbs since Thanksgiving. That is about one deep frame of honey.